The Revolution began the second half-opening three-game series at Bridgeport a man down, at 24 active players. They were to add another outfielder, but the deal fell through. It was an international player and there were work visa complications that prevented him from joining the team. The spot had been opened by James Shanks’ bothersome hamstring, but Shanks is over that injury enough that he is now back on the active roster. Right-handed reliever Anthony Slama has also been added to the roster. To make room for Slama, York placed Corey Thurman on the inactive list until after the All-Star Break. Thurman had to leave the team and missed the trip to Bridgeport, in order to travel to Michigan for a family issue. He is en-route back to York, but rather than make his scheduled start July 6 after a week-long layoff, Mark Mason and John Halama have decided to wait until after the break. Other than the five Revs headed to Southern Maryland for the All-Star Game on July 10, the club will have four days off starting Monday. The schedule resumes Friday, July 12 when the Blue Crabs come to York. Baseball Operations Manager Andrew Ball indicated that the current starting rotation of Thurman, Brett Tomko, Chris Cody, Nick Green and Rick Zagone will be re-set based on Mason and Halama’s discretion once everyone is on full rest after the break. Pedro Liriano will continue in his role of bullpen spot starter when needed. Of course, when Thurman is added back to the active roster, a corresponding move (release) will need to be made for Slama. Also, left-hander Kris Regas remains on the inactive list for the time being, but is still with the Revolution. Slama is in his seventh professional season, and made his MLB debut with the Minnesota Twins during the 2010 season, appearing in five games out of the bullpen. 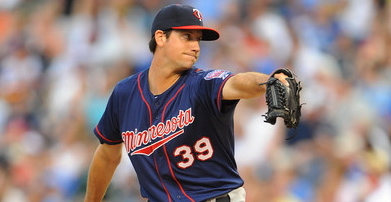 He reached the Majors for two more games in 2011, also with the Twins. He has spent the bulk of the last three seasons with the Rochester Red Wings, Minnesota’s Triple-A affiliate, including 13 games with Rochester this season before joining York. Slama was most impressive with Rochester; last year in 31 games and 36.1 innings he had just a 1.24 ERA and notched 14 saves. The prior season in 2011, he carried a 2.92 ERA in 27 games and 37 innings with a save. In 2010, he appeared in a career-high 54 games with Rochester, and sported a 2.20 ERA in 65.1 innings and notched 17 saves. In seven years total in the Twins organization, he has 102 saves. Slama saved a career-high 29 games in 2009, with 25 at Double-A New Britain and four more at Rochester. He also posted 25 saves in 2008 at A-Advanced Fort Myers. The southern California native was drafted by the Twins in 2006 out of the University of San Diego. This entry was posted on July 5, 2013 by blogtoblogchamps. It was filed under Coaching Staff, Corey Thurman, Player News, Team News .